I have an 8-year old who lives near us and who has been a big part of my time here in Curacao. I’ll call her “Alice”. Alice is one of the prettiest girls I have ever seen. She has skin the color of honeyed hazelnut, and light olive green eyes. Alice’s mother is an illegal immigrant from Jamaica who worked as a hotel maid until she lost her job a few weeks ago. Since then, Alice’s mom pretty much stays inside and plays on Facebook or goes out with her boyfriend, aslo a Jamaican. Alice is an only child and doesn’t have anyone to play with when she comes home from school. “My mom doesn’t have time for me,” Alice tells me. “She would rather be on the computer than play with me.” Because of Alice’s mom’s illegal status, and the fact that Alice is unregistered here in Curacao, her mother does not like for her to walk to her friends’ houses nearby for fear that she may be discovered and deported. So my boyfriend and I often hang out with Alice. We’ve taken her to Adventure City, a place for kids with arcade games, bumper cars, and prizes that kids can win. We help her with her math and Dutch homework sometimes, we watch bootleg movies together, and when her family doesn’t have enough money for food, I make sure to cook extra to give Alice a plate. In return, she draws us pictures that we proudly display on our fridge, helps me with my Papiamentu, and brings me beautlful sea glass that she collects on the beach. One thing that Alice seems obsessed with is making beds. If my boyfriend or I am home, the first thing she does is knock on our door to ask to ask us if she can “spread the bed”. Yeah, sure, knock yourself out, kid. After several bed-spreading requests, I asked Alice last week why she was so obsessed with making the bed. “Well, if I want to work in a hotel, then I have to learn to spread the bed really, really good. So I want to start practicing now so that later, I can be really, really good at it and make beds nice,” Alice replied enthusiastically. Her reply really hit me hard. Here was an 8 year old girl getting a head start on her hotel maid career. It is true that in Curacao, many cleaning ladies are Jamaican. I realize that that is probably all Alice has seen to aspire to be as a Jamaican on this island. I struggled with wanting more for her, to tell her, Youre EIGHT YEARS OLD. You should be wanting to be an actress, a singer, a scientist, a dancer, a model, or gosh, even a princess! Is being able to dream about those things a privilege? I don’t know. All I know is that I’m not Alice’s mother, and as much as my well-meaning and softhearted boyfriend thinks we should adopt her and take her out of her situation, we cannot. Instead of being sad about it, I tell him we should be thankful and grateful for the chance that we have gotten to know Alice, who, despite her circumstances, is a cheerful, sweet, sensitive, and intelligent child. 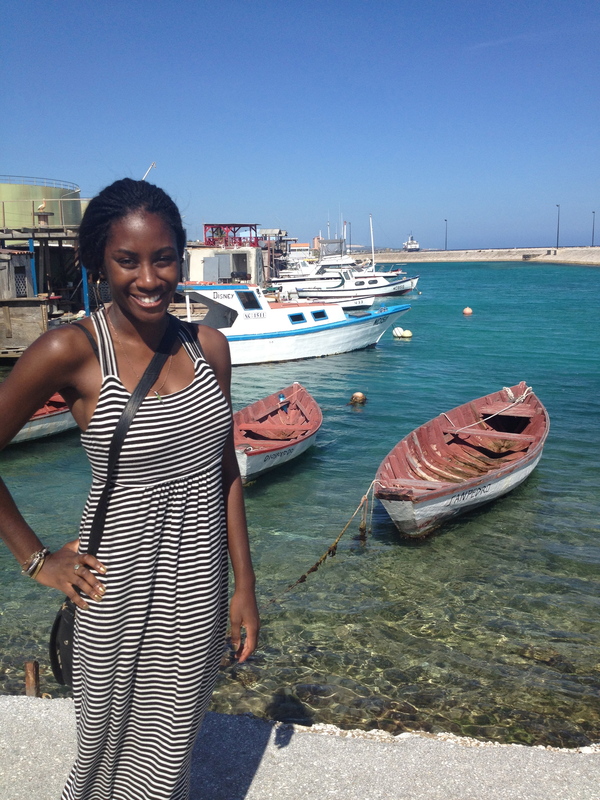 This is my second week here in Curacao, and I’m glad to report that things have been going pretty well so far. This go-round is actually my fourth time to come to the island this year. In the beginning, for the first few days, I was definitely in vacation mode. Sleeping, eating, playing with my 8 year old neighbor, and some beaching were all I wanted to do in order to de-tox the New York from my system. After a few days, however, it began to set in that I needed to switch off from vacation mode and turn to “I-actually-live-here-and-need-to-get-a-job” mode. And living here has been, and will prove to be, an interesting experience. I come to Curacao as an outsider in so many ways. Linguistically, I don’t speak much Dutch and I don’t speak Papamiento (the local language of Curacao, which is a mix of Dutch, Spanish, English and Portuguese). I can definitely get by in English here, but my inability to speak Dutch and Papiamento makes me feel like I have to contend with a double language barrier here. Despite the assurances of both Dutch and locals that English is sufficient to survive and get a job on the island, I suppose I’m looking to do more than just “survive” here. Most Dutch people speak English, and many are kind enough to switch their conversations to English when I am around, but I do admit I’m conscious of the fact that they are switching to accommodate me. But I am lucky that my Dutch boyfriend and his circle of friends have done an amazing job of making me feel welcome and have agreed to speak “Dinglish” to me so that I can start speaking nederlands little by little. Culturally, I admit I had never really met a Dutch person before coming to Curacao this year. My experience with the Netherlands had be limited to countless KLM layovers at Amsterdam’s Schipol airport en-route to Ghana. I have probably been to Amsterdam Schipol near a dozen times by now, but I was never adventurous enough to go explore the city. 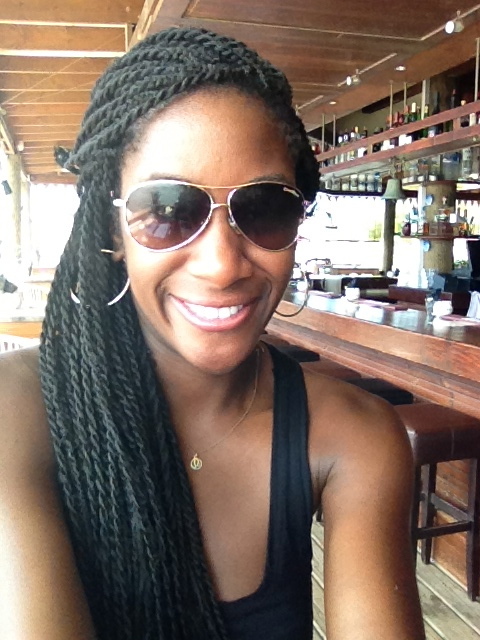 So oddly enough, my time in Curacao has been my introduction to Dutch culture, Caribbean-style. They love potatoes, mayonnaise on their french fries, being tall, efficiency, honesty, being VERY punctual, and cheese. Not necessarily in that order, of course. It is clear though, that there is a separation between the Dutch community and the local community. More on that later. Curacao does not have a huge diaspora to the United States, so being here is the first time that I have been introduced to their culture. This is my first time really learning about Caribbean culture in general. That week long Carnival Cruise my family and I took to the Carribean when I was about 10 or so hardly counts as real “experience” in the Caribbean. I find the Caribbean to be under-reported in America, and even more so the Dutch Caribbean. Now, there is of course the question of how I interact with the local people here. Even the words “local” vs. “native” is tricky. There are Dutch Europeans whose families have been here for generations. There are people from Colombia, Venezuela, Haiti, and Jamaica. The question of who is a yu di Korsou, (literally means a “child of Curacao” in Papamiento), or a true Curacaoan, is a bit of tricky question of identity. Because really, the way I see it, whether they are the descendants of the African slaves brought by the Dutch, recent migrants from South America or other Caribbean islands, everyone here is from somewhere else. (The actual native Amerindian tribes that were on Curacao either migrated out, or were subdued by Europeans). For the most part, I see “local” as referring to non-white European inhabitants of the island. Despite my dark skin, people can immediately tell I’m foreign. Most people assume that I’m Jamaican. I don’t know why. It is true that not as many Americans visit the island. Maybe for people here, “English-speaking black foreigner” = Jamaican. Talking with some locals, of course there is the perspective that the Dutch people are arrogant, condescending, and racist. Locals here are accurately aware that numbers of Dutch people (as well as politicians in the Netherlands) see Curacao as a backwards banana republic headed by incompetent and corrupt politicians. Of course, not every Dutch person feels that way, and many live here and love the way of life and the culture. But locals seem to feel that the Dutch come here to make their money and live their island paradise lives without making any attempt to contribute to the long term human development of the locals on the island. There is a sense among locals that the Dutch refuse to acknowledge or recognize the economic and human exploitation of the past, and that those past exploitations and dependencies were, and still are, systemic. But there is a sense of increasing nationalism and an attempt to assert a Curacaoan identity apart from the Dutch that is here. 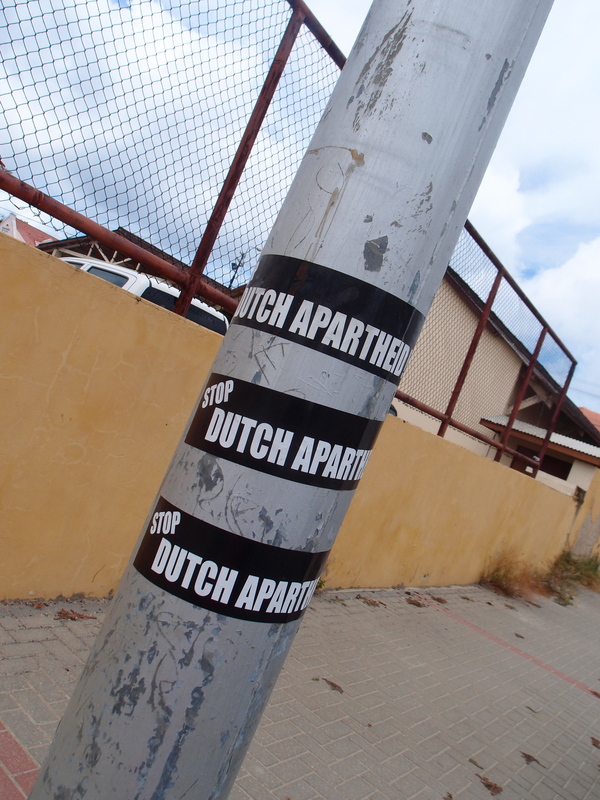 “Stop Dutch Apartheid” stickers in Willemstad. Being black outsider isn’t such a bad thing. As an outsider to both the locals and the Dutch, I suppose I take a bit of an observer role. But its almost like I can physically feel a deep rooted mistrust and tension between Dutch and local populations here. To me, it is obvious that there is a lack of cultural and physical spaces for meaningful discourse and dialogue between the Dutch and local people. It’s incredible, and a bit tragic that such hostilities and resentment can exist on such a small island, and judging from the impending elections here in Curacao, it is possible that things could get worse. I will say, that many people find me to be interesting. Again, not many Americans come here, and I think that people, both local and Dutch, appreciate that I took such a risk to come here and learn about the island and about cultures totally different from mine. Plenty have told me that they are interested in my perspective as a non-Dutch and a non-local. I will definitely continue to share my thoughts here so, watch this space! So far, so good in Curacao!